Comments: Not too much has changed, but you can't beat the price. Fans have been salivating over a Gamecube Zelda adventure since a Gamecube tech demo featured a highly detailed adult Link squaring off against Gannon. The demo featured facial expressions and Gannon's flowing robe. Many assumed that this would be the format of the inevitable Gamecube Zelda. Thus, the gaming community was shocked when the first screenshots of Zelda: Kaze no Takuto (or as it would later be dubbed in English, Zelda: The Wind Waker) appeared... The game featured a chibi or super deformed, child-like Link in a cel-shaded world. If nothing else, the new Gamecube Zelda promised to look like a Saturday morning cartoon. However, Link has seen life on the Gamecube before Wind Waker's release. The original Nintendo Legend of Zelda is available in Animal Crossing, while a brilliant pre-order bribe has Link fighting on the Gamecube in not one, but two adventures. For those unfamiliar with The Legend of Zelda: Ocarina of Time, the game premiered in the U.S. on the Nintendo 64 in November 1998. Widely considered the best Nintendo 64 title, Ocarina of Time brought the series into 3-D. While this was a radical change for the series, the game was able to keep the feel of its predecessors (like Mario 64 before it and Metroid Prime later). In the game, Link battles in Hyrule as both a child and an adult. He crawls through various dungeons, solving puzzles and battling enemies with a variety of weapons. As Nintendo was readying its Disk Drive 64, an add-on for the Nintendo 64, one of the games it created was a remixed version of Ocarina of Time. Dubbed Ura Zelda, the game featured the same engine and plot as Ocarina of Time. However, the various dungeons, enemies, and puzzles within Ocarina of Time were radically changed to become more challenging. The DD64 was released briefly in Japan, but failed miserably. Thus, Ura Zelda never saw release. In a marketing coup, Nintendo decided to package the original Ocarina of Time along with Ura Zelda (renamed The Legend of Zelda: Master Quest) as a pre-order bonus in Japan, North America, and Europe. 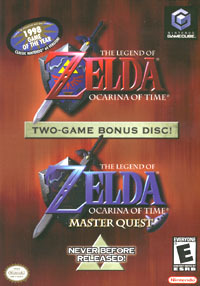 The Master Quest disc came out in February in the U.S., preceding the March release of Wind Waker. Anyone familiar with the original Ocarina of Time will be at home immediately in Master Quest. Indeed, at first Master Quest seems unchanged from Ocarina of Time. Other than a change to higher resolution display (and the support of progressive scan), the graphics in both games remain unchanged from their Nintendo 64 counterparts. The game mechanics are nearly exactly those of Ocarina of Time; Link is visited by a fairy guardian, who assumes many game play duties. Using the L Button (the Z trigger on the Nintendo 64,) Link can target friends and foes and by pressing the A button he can talk to or attack them, respectively. Using item subscreens, Link can check his equipment, the status of his adventure, the songs he's learned, etc. Other than the change from Z to L for the target button, the mechanics have received a few minor changes. Instead of having to hold Z to keep a target, the L button can be let go while still targeting. Additionally, instead of C buttons, the Gamecube has a C stick; in the Nintendo 64 version of Ocarina of Time, the C buttons could be assigned items, that would be used when the button was pressed. They were also used to talk to Link's fairy, Navi, and to play notes on Link's magical instrument, the ocarina. All these duties have been shifted to the C stick on the Gamecube. The stick functions reasonably well, though especially when playing songs, it is easy to press diagonally on the stick and make a mistake in the song. However, the C stick is the only option for the Gamecube controller; using the D-pad would make several instances of game play impossible. However, the X, Y, and Z buttons also function for the C stick, giving the player an option as to which to use. Unchanged is the control stick sensitivity. The original Nintendo 64 game seems somewhat less responsive to slight presses on the control stick, as compared to current Gamecube games. Master Quest and the version of Ocarina of Time on the Gamecube keep the stiffer control of the Nintendo 64 version. The beginning of the game is extremely close to that of Ocarina of Time. So what is the difference between the two games? When one enters the game's first dungeon, within the Deku Tree, it is apparent that Master Quest is different from Ocarina of Time. The tree is much more dangerous, with different enemies, including a number of bats and Gohma eggs. The dangerous creatures often fall out of seemingly nowhere onto Link, making the tree much more difficult to get through. The puzzles and item placement within the Deku tree are also new in Master Quest. These changes to the dungeons make up the bulk of Master Quest's differences. The enemies have been made much more dangerous and aggressive (the daggered Lizard men that attack young Link in the Volcano are much more prevalent throughout the various dungeons) and the dungeons themselves are much more difficult. There are a few graphics changes between Ocarina and Master Quest; most of the Crescent Moon symbols that littered Hyrule have been changed to the "Master Quest" logo. In the dungeons, a few changes have been made; in Zora's domain when there are cows stuck inside the whale's mouth, their plaintive moos give the room an eccentric feel. Overall, there's nothing to lose in Master Quest; it comes free with a Wind Waker pre-order. Fans of Ocarina of Time will eat the new challenge up, while those who didn't play 1998's Game of the Year (according to the Academy of Interactive Arts and Sciences) will get a chance to rectify their mistake.